Reality of Reality Shows; Is it REAL? This is from bible. And no wonder how true it holds with one thing or the other we can relate ourselves to. Lately, with not so much a thing scheduled for weekends and being at home with parents and relatives, one thing that I have become a part of is a TV program called Druk SuperStar in our only television channel, BBS. Of course nothing so pompous and extravagant like a thing or two we usually run upon on flipping the channels in Indian televisions. The concepts of reality shows of such have inspired our local entrepreneurs or entertainers to come up with same and it is doing more than just novelty. Over the last few years, from the disastrous Passang Tamang show in Thimphu to the moderately successful Bhutan Idol, so many things have come up to reach at the level Druk Super Star is now. Today, even before the end of Druk Super Star, the registration for Bhutan Star has already begun. However, such reality shows are appearing to become far from reality. It can be said that emerging winner is because one has immense talents in singing and one has captured the hearts of viewers and thus be celebrated when one triumphed. But the thing that is unsaid is of one being perhaps at the end of huge financial support which is so much a good deal to mint the money for the organizers and television channels, and of course stand out from the other contestants. In a SMS voting like ours, where in an average a only handful of people watch the show, and amongst it, only a meager number of people perhaps vote, and yet one receives the considerable votes even if other better ones are undeservingly ousted from the shows only because the votes garnered is way too less, let forget the quality of show we are presented with, it somehow questions our attitude towards accepting the best at the cost of our dear and acquainted ones. The achievement of the share of fame for the young dreamer is in the price one has paid not with one’s talent but in kind, can there be anything as guilty as it? The above is one of the many loopholes in selecting the winner through SMS voting. There are many of such where judges do not have any share in making decisions to choose the winner and when the public voting is all that matters. Another factor that is so much at peak in SMS voting is regionalism. There is no need to look for examples outside. I hear my friend sharing me that certain folks are not happy with one of the contestants who happens to be from their native, and that they would not vote for him this time for reasons they know of. And over a cup of tea, and a performance airing on TV screen, my uncle, an avid viewer says that the performer’s father and sister invests (if the word justifies its end) so much in him. Whether he sustains till the end of the show, neither himself nor his father knows, but it would definitely put things into chaos even if he wins the show. With the few amount of money he will receive as the prize money, the price he and his father pays would definitely fill the kitty of the organizers and mobile service providers. The problem (if I may put it) is not with who gets what and how much money but it’s with us, the people who are putting the money in it. Is our money going in for the benefit of the right person? Are we paying for the true talented person’s performance? When Dechen Zam and Minzung Lham were declared eliminated for having garnered least votes, things have had its turn around. It was however good, something I guess even those who voted for their favorite must have realized to have voted these two super talented singers back into the competition. Howsoever the format of the competition is, there’s no doubt on the quality of voice. 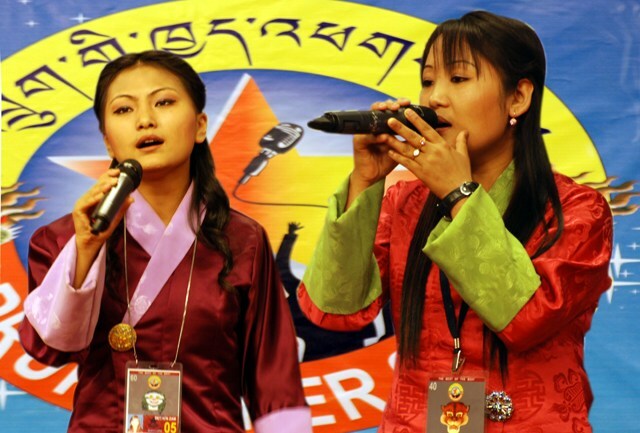 These singers are very good even to be in that kind of competition. If it’s not for the age or anything similar, these singers can even be called to be the mentors or judges. But with other underserved singers still vying for the sweetest fruit of the competition when these girls have to leave the show irrespective of their talents, it questioned the reality of SMS voting. SMS voting is good that public is involved in it. We choose the winner. But is it all good to be leaving everything to the public whose knowledge on technicalities of singing is questionable? What criteria people have when evaluating the best? On what basis one is voting? What is the use of judges if it’s all for the public? Aren’t our judges the better persons to understand the disciplines of singing? There are many to realize, and as such shows are gaining popularity, it is no mystery to expect so many controversies to come up with it. And shadows will never disappear until we come up with something better. Yes, something fair and judicious. Whatsoever, and howsoever the change in voting system would affect the niche of the business agenda behind it, there has to be some methods to improve the procedures to arrive at the deserved victor. Why not we restrict the number of votes a mobile can sent through SMS? And if it affects the business of the show, why not like Miss Bhutan Contest have certain percentage of power shared with judges in choosing the winner? Do we have any other better ways to device a method which is above all REAL?